Dr. Anna Grichting and the Urban Forest by Nakheel Landscapes, Qatar National Convention Center, the venue for the Sustainable Urbanism New Directions Workshop. © Qatar University. Nakheel Landscapes, the landscape contractor and a sponsor of the Sustainable Urbanism New Directions Workshop, constructed an Urban Forest at the Qatar National Convention Center workshop venue to highlight the importance of trees in creating sustainable and healthy urban landscapes. According to Nakheel Landscapes, it is important to support such types of workshops and to collaborate with research and academia to provide novel and innovative solutions to urban landscaping in Qatar and the region. 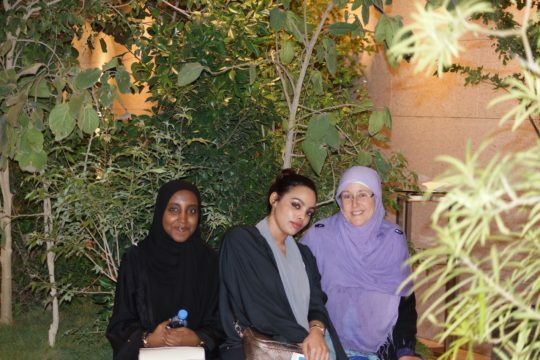 Luzita Ball (right) with students attending the Sustainable Urbanism New Directions Workshop, Qatar National Convention Center, 21 March 2016. © Qatar University. 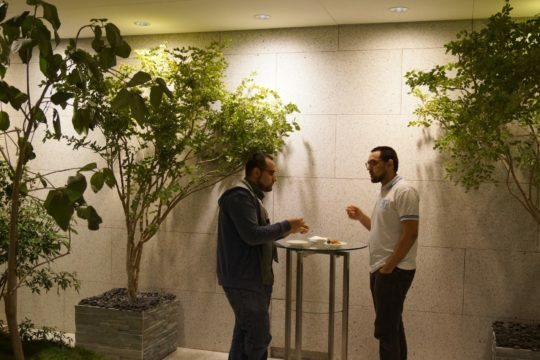 Two delegates chat at break time in the Urban Forest presented by Nakheel Landscapes, Sustainable Urbanism New Directions Workshop, 21 March 2016, Qatar National Convention Center. © Qatar University.